History collides with the digital revolution at the Axiom Hotel San Francisco. 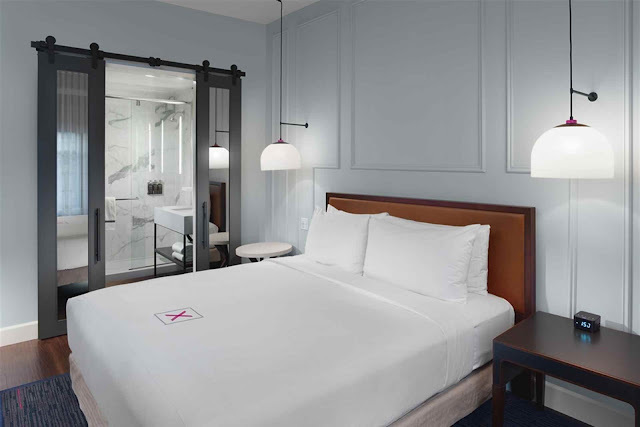 This Hotel combines turn-of-the-century history with modern design and seamless technology. Located in Downtown San Francisco, this hotel is steps from Powell and Market Cable Car Turnaround and Westfield San Francisco Centre. Warfield Theater and Golden Gate Theatre are also within 10 minutes. Powell St. Station is only a 3-minute walk and Civic Center Station is 10 minutes. Along with a restaurant, this smoke-free hotel has a 24-hour fitness center and a bar/lounge. WiFi in public areas is free. Other amenities include a coffee shop/café, valet parking, and coffee/tea in a common area. All 152 rooms provide conveniences like sofa beds and refrigerators, plus free WiFi and flat-screen TVs with digital channels. Guests will also find iPod docks, room service, and premium bedding.